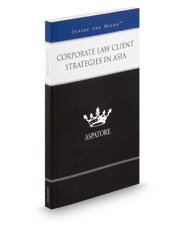 Corporate Law Client Strategies in Asia provides an authoritative, insider's perspective on assisting clients entering the Chinese and Cayman Islands marketplaces. Experienced partners from across the globe outline the differences between Asian and U.S. corporate laws, and guide the reader through the risks and benefits of conducting business in Asian countries, including lack of human infrastructure and increased urbanization. These top lawyers offer specific advice on respecting business customs, navigating country-specific challenges, and complying with the laws of local jurisdictions to prevent potential problems. Covering a range of topics from overcoming obstacles affecting future business opportunities to pursuing arbitration in neutral venues, these experts stress the importance of familiarizing clients with Asian corporate structures prior to entering the market and discuss the increased trend in alternative dispute resolution over litigation. The different niches represented and the breadth of perspectives presented enable readers to get inside some of the great legal minds of today, as these experienced lawyers offer up their thoughts on the keys to success within this ever-evolving legal field.